Almost all buildings that are open to the public in North Jersey are required to have signs that are compliant with the Americans with Disabilities Act (ADA). 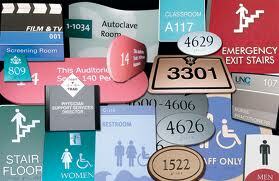 This includes signs in your parking lot as well as interior and exterior markers. 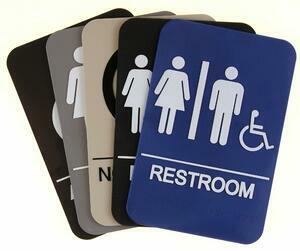 Fortunately, The Sign Center is one of the top suppliers of ADA compliant signs for North Jersey and beyond. With our top-quality, state of the art portfolio of products, we will help your organization meet ADA standards. Additionally, we can create custom signs for your building with our fabrication process. We make sure your ADA markers are in compliance for many years to come by supplying a wide variety of durable materials that are designed to stand up against harsh environments. Some of the material alternatives we provide are plastic, acrylic, high-density urethane, wood, and aluminum. 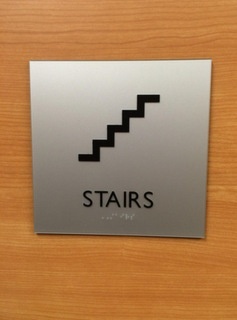 Where Is ADA Signage Required? The fear of potential fines and lawsuits as well as complaints is what drives most organizations to purchase ADA signage. This typically leads them buying the cheapest ADA markers they can get. This is not the smartest solution. You are missing a chance to boost your name recognition when you buy standard signs. With custom ADA signs, we can include your business’s colors, fonts, and logo while still communicating required information to guests. These signs will drive sales by helping your brand awareness. Based on the materials you want, our signs are completely customizable. There are options that will complement any interior décor. With our cutting-edge equipment and technology, there are endless ways we can personalize your markers. To make certain we provide the best results for our customers, we hold each of our ADA sign jobs to the highest standards. When designing your ideal marker, our graphic artists have access to a broad array of resources. We are your one-stop sign shop thanks to our experience with ADA sign regulations. We can even come to your building to perform a site survey and give our expert advice if you are unfamiliar with the ADA and how to bring your facilities up to code. From our shop in Berkeley Heights, The Sign Center is proud to supply sign maintenance, installation, fabrication, and design services for organizations throughout North Jersey. If you would like to find out what we can do for your enterprise, contact us today for a free consultation and estimate on ADA signs.